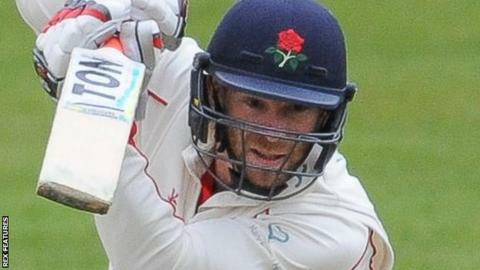 Lancashire built a huge lead with the help of Luke Procter's century on day two against Hampshire at Old Trafford. Procter made a dogged 137, his highest first-class score, and Alviro Petersen a sparkling 81 in a total of 465, a first-innings lead of 347. It would have been greater had it not been for a fiery and entertaining spell from Tino Best, who took 5-90. Jimmy Adams fell to Jimmy Anderson early in Hampshire's second innings as they closed on 22-1, 325 runs behind. Their quest to avoid an innings defeat will be aided by a surface that remains true, albeit with some turn on offer to the spinners. Indeed, the way Lancashire piled on the runs on a hot day further highlighted the inadequacy of Hampshire's meagre first-innings 109. Procter was at first in the company of Haseeb Hameed, who made a careful 62 before edging the impressive leg-spin of Mason Crane to slip, with Petersen then arriving to make batting look easier than anyone else in the match. While the South African busily accumulated and punished anything loose, Procter, favouring the leg side, registered his second first-class century. It was when Petersen was caught hooking Best that Lancashire began to slide in the face of some thrilling, hostile bowling from the West Indian. Procter was caught pulling, while Liam Livingstone had his stumps uprooted and James Anderson was comprehensively bowled. Faced with such a huge deficit, Hampshire instantly lost Adams, who edged a beauty from Anderson, before Michael Carberry and England hopeful James Vince watchfully ensured there were no further loses. "I'm over the moon. To get a century at Old Trafford was one of my boyhood dreams and it's come true. I didn't really think about it when I was out there. I just kept batting. "The bowlers did a fantastic job for us in the first innings and then for us to put 450 on the board is fantastic. We just wanted to bat all day. There was no rush with how fast we got our runs. "Haseeb is really good to bat with. He is calm and that calms you down. Alviro was great too. He puts the pressure back on the bowlers. When they come hard at us he goes back hard at them. "Ashwell Prince batted at three last year and it's obviously big boots to fill bit I've really enjoyed it. I've had a few starts so it's good to get a century on the board." "Mason Crane bowled beautifully. For a 19-year-old leg spinner to have that much control is amazing. England have produced a quality leg spinner. He is really one for the future. "He kept it tight and it gave me the opportunity to really run in and express myself. That's why Hampshire have brought me. At the end of the day, you only have a short while to play this game and I'm 35 this summer. But I'm fit and strong and I'm always ready to go and to commit myself. "The sun was warm, the wicket was flat and I thought to myself that this is just like first-class cricket in Barbados. But you still have to run in hard and bowl quick and that's what Hampshire are paying me to do. "The best wicket for me was getting Steven Croft. He is a good player who can take the game away from you. Alviro Petersen was a prize wicket too. It was a good battle. West Indies versus South Africa. And I'm not going to back down. I knew he was going to play his pulls but I made sure he didn't pull me out of the park because I back myself. That was a big wicket as he is a class act."